The second look in my series of transitional outfits with American Eagle. To me a good pair of denim is everything in a wardrobe and I can't say enough about these AEO Denim X4 Hi-Rise Jegging! The fit is incredible! Stretchy but yet they don't bag out throughout the day. They are also designed to lift the tush and contour your legs, and ladies let's be honest who doesn't want that? Overall I would highly recommend and plan on purchasing more styles and washes myself very soon. I'm also wearing the AEO Embroidered Swing Shirt. 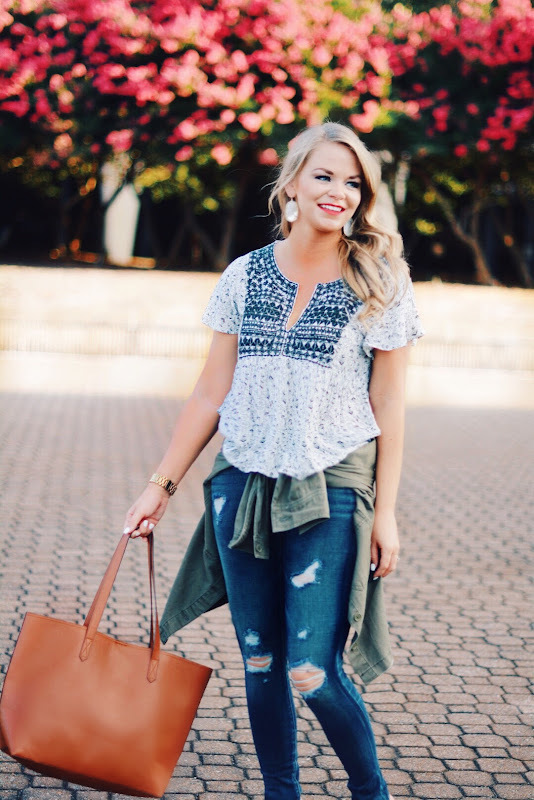 A boho inspired top with the cutest embroidery detailing. It looks great paired with a military jacket that you can tie around your waist until cooler temps arrive. Stay tuned for more from this collection soon and be sure to follow me on Bloglovin by clicking the link below or on my sidebar! I have likewise instructed in various specialized EDUCATION MUT curriculum conduct independent schools that completely isolated these agitated understudies with handicaps in dealing with their conduct from their standard associates by placing them in totally unique structures that were now and again even in various towns from their homes, companions and companions.